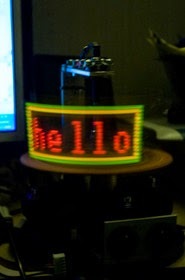 This unit has a single column of LEDs that are spinning in a left to right motion, as it spins a microcontroller keeps track of the exact position of the board. Words are written in the air by flashing the correct bit pattern in the correct location. The same word is repeated over many revolutions of the device, each time the LEDs turn on in exactly the same locations. This works because of something called persistence of vision, the eye retains the image for a split second.